Evergreen shrub from a rhizome; stems branched, erect, 10-60 cm tall, leafy; bark and wood yellowish. 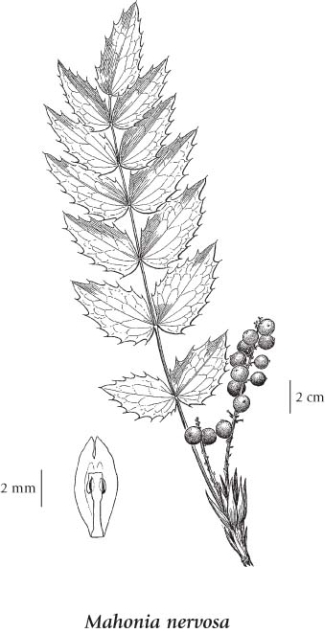 Evergreen, hollylike, turning reddish in the fall, alternate, pinnate; leaflets 9-19, palmately nerved, with spiny teeth. Inflorescence of clustered racemes up to 20 cm long; flowers yellow, the segments in 6's. Clustered berries 8-11 mm in diameter, blue, glaucous, with a few large seeds, edible. Mesic to dry open slopes and open forests in the lowland, steppe and montane zones; common in SW BC, infrequent eastward in S BC; S to CA. A shade-tolerant/intolerant, submontane to montane, Pacific North American evergreen shrub. Occurs in maritime to submaritime cool mesothermal climates on moderately dry to fresh, nitrogen-medium soils; its occurrence decreases with increasing precipitation, elevation, and continentality. Scatered to abundant, occasion­ally dominant, in the understory of semi-open forests (persists on cutover sites) on water-shedding sites. Inhabits coarse-skeletal soils. Commonly associated with Gaultheria shallon, Kindbergia oregana, and Polystichum munitum. Characteristic of mesothermal forests.